Art Arfons with Green Monster Cyclops, converted jet land racer in which he hopes to break world water speed record. A 41-year-old father of three hopes to smash the world water speed record in a converted car that will ride on rubber tires. He call his creation Green Monster Cyclops, treat it like one of his children ("She was born in Dayton, Ohio") and says it should be able to do at least 300 miles an hour. Send for a psychiatrist, you say? Not a bad idea, except for one thing. The dreamer happens to be Art Arfons — a self-taught mechanical genius, hot-rodder, constant contradicter of skeptics who tell him, "It'll never work," and a three-time holder of the world land speed record. "The way I figure it," he explained here the other day, "the two tires will ride solid on top of the water at high speeds. Without the tires, I wouldn't even have tried to build this boat." Arfons was in town with his converted land racer (it once hit 342.88 miles an hour as the Green Cyclops on Utah's salt flats) for what he referred to as "a little public relating." The relating took place outside the Park Avenue headquarters of Union Carbide, whose Prestone Jet Wax is being used on the aluminum craft to protect the finish and reduce skin friction. "It's to my advantage not knowing how to drive a boat," said the man who has survived land crashes at better than 550 m.p.h. "She's not going to handle like a boat. I'm going to driver her like a car." The driving will begin with trial runs on Michigan's Hubbard Lake in April or May, depending on how early the ice leaves. In June, on Lake Mead in Nevada, Arfons will attempt to break the record of 276.33 m.p.h. set by the late Donald Campbell of England in 1964. Campbell, attempting to push the record above 300 miles an hour "so the Americans won't get it," was killed last Jan. 4 on Coniston Water, England, when his jet-powered Bluebird flipped and plunged to the bottom of the lake. New Yorkers who inspected the Green Monster Cyclops the other day seemed to feel the same fate would overtake Arfons. "That guy's gonna kill himself," a number of passers-by remarked after studying the 27-foot, jet-powered catamaran whose name derives from its green cockpit and single headlight that stares from a torpedo-like nose. If Arfons head them, he paid no attention. In 1965, when his car lost a tire at Bonneville after regaining the world land mark with 576.533 miles an hour, the driver told rescuers, "No, I wasn't scared. I don't get scared." Last Nov. 17, the former professional drag racer from Dayton was back on the salt flats in Green Monster, once again trying to regain a record that had since been raised to 600.601 m.p.h. by Craig Breedlove of Los Angeles. This time, Green Monster went out of control at 585 m.p.h. and rolled over, demolishing itself but leaving Arfons with only minor cuts and abrasions of the face from the sand-blasting effect of the salt spray. He was out of the hospital trhe day after the accident, driving the family car and preparing to give his boat-racing theories a whirl during the year or so it will take to build a new car. Campbell, he feels, would not have crashed if his boat had been equipped with "road holding" tires. "I think he just reached his flying speed and took off," Arfons said. "Enough air passed over the boat to lift it right off the water." The Green Monster Cyclops looks more like the latest novelty ride at an amusement park than a boat. Like the Bluebird, the craft has pontoons and is powered by a jet engine. But the absence of a stand-up rear rudder, plus the presence of the headlight and the tires, give the Arfons creation a much weirder look. Also, the Cyclops cost $7,000 compared with $2.8 million for the Bluebird. The engine, for example, is a surplus J-47 that saw service in an F-86 Sabre Jet during the Korean War. It cost $100. 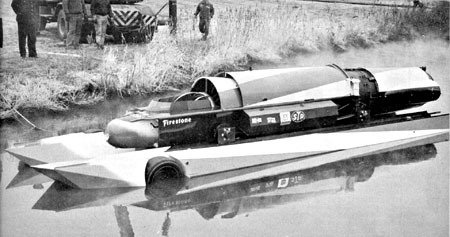 To convert the highly successful drag racer (built in 1960) into a boat, Arfons added two stepped pontoons and put a tire in the forward part of each pontoon. He finished the job two weeks ago. The tires, provided by Firestone, his major sponsor, are the same as those used on the front wheels of Indianapolis race cars: 25-inch diameter, 45-pound air pressure. The only difference is that to reduce spray, they will have no treads. The extend three inches below the bottom of the styrofoam-filled pontoons. Arfons, a 5-foot-11, 185-pounder of American Indian-Greek ancestry whose rugged, prizefighter-like features are softened by warm brown eyes, talked quietly about his theory. "At 80 or 90 miles an hour," he said, "I'll be up on the steps. At 200, we should be planing on just the tires and the tip of the steel rudder. If we have trouble staying on the water, I may put a wing (an inverted airfoil) up front. But I think the tires will work. Between now and April, experts, who go by the book, undoubtedly will try to convince him the tires won't work. But the improviser never has had time for books. In 1964, after his second world-record run, he started reading a book titled "Art Arfons, Fastest Man on Wheels." He never finished it.